OK, so along with my fabric addiction I have a small addiction to a couple of other things...... shoes, specifically boots, and used furniture. Long story short it went straight from the shop to my upholsterer...9 freakin metres of fabric later people! Unfortunately the squabs needed replacing and the denseness prevented them from being pulled in as before, but I still love it and wee girl thinks it's "cool"
...is now going to get the recovered treatment and go into my room! Probably with this gorgeous fabric!!! The view from my deck at 5.30pm...still light Yaaaaaay! 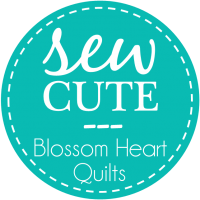 and Alyce @ Blossom Heart Quilts since it feels like forever since I've seen them!!! I love what you've done to that sofa. The cushions really finish it off nicely. I love spring flowers too. I'm not feeling any of that warmth down here yet though. I can see snow on the mountains as I drive into town each day!! You are steeling our light! Give it back :)) Have fun with your chair. Wee girl is right. Pretty cool redo. I love the blue of the sofa and think the black and white will look really striking on the chair. I have to be watchful on hard rubbish days. I find myself driving past wooden dining chairs sitting, free for the taking, on the roadside and I am thinking 'I could repaint that and it would look fab!' But I know it will just sit in the garage for several years and so I force myself to keep driving. What super furniture finds! The b&w will be awesome on that chair and well done with your re-done sofa! Love your new sofa, I want to come steal it :). I use pic monkey for my mosaics, its a great little program some parts are free the other you have a yearly fee, but so much cheaper than photoshop!